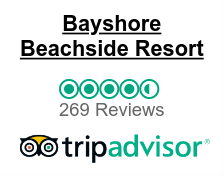 We have just spent four nights at Bayshore. The area is very quiet but a five minute drive into the heart of Dunsborough. The provided amenities in the villas are excellent. I thoroughly recommend this accommodation. Excellent value for money. Bayshore is out of Dunsborough so noise, etc is not an issue but it's close enough to do everything - cycling, walking, tennis, beachside, et al. The villa was very comfortable with all the amenities you need and the arrival bottle of wine and discounts were appreciated and used. The gardens are beautiful and relaxing so having drinks outside was enjoyable. 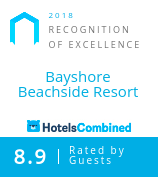 The Bayshore accommodation was lovely. We stayed in the 8 person villa and it was very roomie and had a good outdoor area. 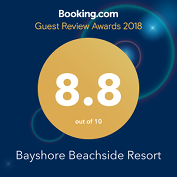 Staff were very lovely and accommodating. It's about a 5 minute drive out of the town center but in a nice quite area across from the beach. Would definitely stay there again.